The above picture is of a Native American Indian Chief called Abdih-Hiddisch, which translates as "Road-Maker". He belonged to the Mandan tribe of American Indians, a Great Plains, which also had strong tribal connections with the Arikara and Hidatsa people. The painting is by Karl Bodmer (1809-1893) and it clearly depicts tattoos on the chest, right arm and hand of the Native Indian together with additional tattoos on his neck and face. In Pawnee mythology the Creator god, Tirawa, was believed to have taught the Pawnee people the art of tattooing. Many American Indian tribes used tribal tattoos and, just like the mysterious symbols they used, the designs of the tattoos would convey secret messages to other tribe members identifying specific clan members. Some American Indian tattoo designs were specific to individual families and passed down from one generation to another. Many American Indian tattoos were spiritual in nature and conveyed ideas about their religion and beliefs. Native American symbols are often designs conveying geometric portrayals of celestial bodies, natural phenomena and animal designs. The following Native American Symbols offer some ideas of tattoo designs that convey specific meanings. The beauty of of these ideas for designs of American Indian Tattoos are in their simplicity and their symbolism. If you are looking for inspiration and ideas for unusual depictions of Native American Indians as tattoos refer to our gallery containing authentic Pictures of the Native Americans of most of the Indian tribes. 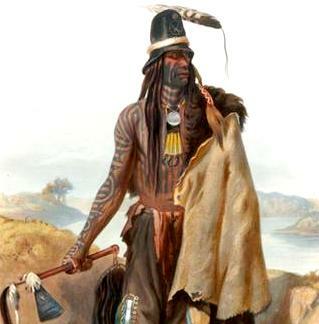 The pictures consist of paintings by famous artists such as George Catlin and Karl Bodmer who were motivated in the 1800's to capture the essence of the indigenous population in their natural environments and conveying their images and lifestyles before they were inevitably and irrevocably changed by the white Europeans. The significance of different designs of American Indian tattoos varied as did the reasons for adopting tattoo traditions. the significance and reasons for adorning American Indian tattoos on the face and body are detailed on the following list. The methods used in the application of American Indian tattoos were quite primitive and could often be painful. The pain involved in the creation of tattoos was seen as an important aspect of the process emphasizing the stoic resolve of Indians and the reaction to and endurance of pain. Many tribes believed that pain brought a closer association to the spirits and gods. Some tribal cultures traditionally created tattoos by cutting designs into the skin and then rubbing the wound with dye. Other tribal cultures created tattoos by hand-tapping or hand-pricking the dye into the skin using sharp stone needles or animal bones - refer to Stone Tools. The Inuit tribes made needle punctures through which a thread coated with a dye or pigment (usually soot) was drawn beneath the skin.